Is the Dumbarton Rail Bridge a Lost Opportunity? On April 9th the Metropolitan Transportation Commission had a committee meeting to reallocate money from stalled projects to others ready to go. Among the stalled projects in the Bay Area is the effort to repair the Dumbarton Rail Bridge between Redwood City and Fremont and establish rush hour commuter rail service from the East Bay to both San Francisco and San Jose. The biggest “winner” in this budget reallocation was BART which was forgiven 91 million dollars from a “loan” of Dumbarton Bridge money. What lead to this decision was the failure back in the November election of 2012 of a transit sales tax for Alameda County to be passed by less than one percent of a 2/3 majority needed for passage. Without Alameda County’s funding the projects had less than half of the minimum $700 million dollars needed for this project. The reality remains that traffic is often congested at the other San Francisco Bay crossings. Traffic is growing to and from the Peninsula which is job rich and housing short. It is very difficult because of environmental factors to build a new Bay crossing and tunneling is very expensive and environmentally disruptive. Yet there are many forces which are working against the Dumbarton Rail Bridge reopening anytime soon. The two potential users of the Dumbarton Rail Bridge are Caltrain and ACE. Adding East Bay traffic to Caltrain would greatly increase Caltrain ridership. Right now that is the last thing Caltrain needs with overcrowding on most of its existing trains. Caltrain’s focus right now is on electrification along the Peninsula. With this is planning to “blend’ future Caltrain service with High Speed Rail service. The constraint Caltrain is facing is neighborhood opposition to adding more tracks to the existing double tracking, particularly around Palo Alto and Atherton. As it is now running future expanded Caltrain and High Speed Rail trains will be a squeeze on the existing double track sections. One bright note, most of the opposition to additional tracks is south of Redwood City. The Caltrain right of way is wide enough for as many as 4 tracks for most of its length. But with electrification, Caltrain will be less likely to want non-electrified trains on its tracks from the East Bay. The issue is acceleration: diesel trains accelerate slower than electrified trains. This can hold up the faster trains much like heavy trucks hold up traffic on the highways. Additional tracks would solve this problem as least as far as 4th and Townsend north of Redwood City. But diesel trains wouldn’t be able to use the new Transbay Transit Center with Caltrain and High Speed Rail in San Francisco. As for service to San Jose that gets squeezed out with the lack of additional tracks. ACE has problems of its own. They have many projects to expand service on their current route and better connections to High Speed Rail and BART. But like most rail agencies it is waiting on a long waiting list for funding for their other projects. Lack of funding for current projects is holding up many other projects besides attempts to cross the Bay to service to either San Francisco or San Jose. The best news is the public still owns the Dumbarton Rail Bridge. The Southern Pacific Railroad was only too happy to sell it and adjoining right of way for a song. As it is the bridge is out of service and needs millions of dollars of work to put it back in service. It might be a good idea to replace the entire bridge if this crossing is ever put back into use. The right of way for this bridge and connections to rail junctions makes this a valuable public asset. It is very difficult to get right of way, let alone environmental clearances around the San Francisco Bay to build any new bridges or new tunnels. It will be a mistake to give up on the Dumbarton Rail Bridge. It will be a major connecting link between Capitol Corridor trains, BART, ACE and High Speed Rail to Caltrain and the cities on the Peninsula. 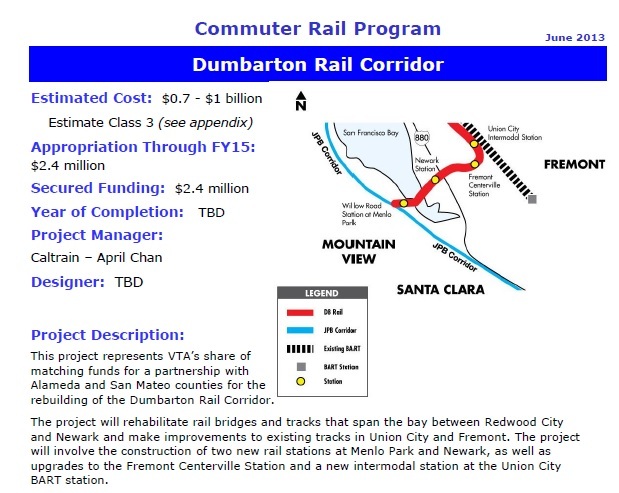 The Dumbarton Rail Bridge would provide a direct connection to Sacramento and the northern San Joaquin Valley to San Francisco.This could be possible with additional tracks north of Redwood City. With such additional tracks the Dumbarton Rail Bridge could also be used by future “Coast Daylight” trains from the south along the coast to access San Francisco while bypassing the track congestion around Palo Alto. 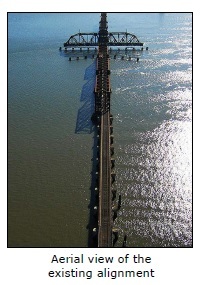 This is a recent photo of the Dumbarton Rail Bridge also on the VTA’s fact sheet posted online. The bridge is out of service and has been left opened for years. Part of the bridge is wooden and damage from a fire somes years ago is one reason it is out of service. One good thing done in the 80’s and 90’s was local governments bought quite a bit of railroad rights of way in California. Sometimes it looks like these rights of way will never be used. A good examples of this would be the Santa Monica Air Line between Santa Monica and Los Angeles. The Santa Monica Air Line was perfect for light rail to the congested Westside of Los Angeles. But local NIMBY’s opposed any construction for years. Reality and years of grass roots efforts finally got the “Expo Line” built after years of delays and setbacks.The Dumbarton Rail Bridge has been greatly delayed. But it will be needed even more in the future than it is needed already.